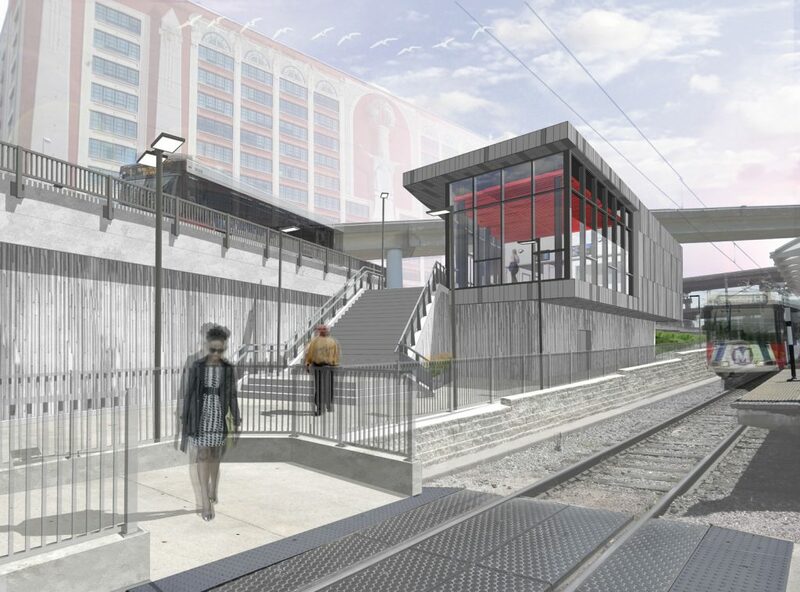 The expansion of Metro’s Civic Center Transit Center at 14th and Spruce Streets in downtown St. Louis is nearing completion, and MetroBus service to the redesigned transit center is scheduled to resume on Monday, August 14. The completely redesigned Civic Center Transit Center has been enhanced to accommodate more MetroBus vehicles and will offer new customer amenities, including a transit center building with public restrooms, an indoor waiting area, digital arrival-time boards, concessions and on-site security and operations personnel. Starting August 14, all 23 MetroBus routes that serve downtown St. Louis will meet at the Civic Center Transit Center and will connect bus riders with MetroLink. Four existing MetroBus routes will be split into eight new routes, and these shorter routes will provide passengers with more direct service and better reliability. Want to learn more about the Civic Center Transit Center? Join us at City Hall to learn about the new routes and where you’ll catch your bus. WHEN: Wednesday, July 26 | 11:30 a.m. – 1:30 p.m.
WHERE: St. Louis City Hall Rotunda, 1200 Market St.
Construction of the redesigned Civic Center Transit Center began in April 2016. Metro successfully competed for federal funding for the Civic Center Transit Center expansion project, and that funding supports 80 percent of the total project cost of $10.5 million. The new numbers for the split of the Soulard bus are backwards. Before the combination, the northern half was 30 and the southern half was 21. The 21 has been assigned elsewhere, but the northern half should be returned to 30, not 19. Steven, I’m unclear what you are referring to. As it is posted, the current #30 Soulard route will be split into two routes to improve performance and reliability. When the service change occurs on August 14, the #30 Soulard MetroBus route will be no more. Instead, it will be split into two routes — #19 St. Louis Avenue (serving the north region) and the #30 Arsenal (serving the south region). The route numbers that were combined to form the 30 Soulard were the 21 and 30. The 30 was the north end of the route. Therefore, after the split, the 30 number should be used on the new north route, not the south route. Now I am confused about one change. I understand putting Broadway back on an old route: SC Shopping to VA to Downtown. No prob. What I don’t see is if there will be changes in the S Lindbergh route or are they going to run 2 buses from S County to VA to Catalan? Also why give S Broadway the route #20 designation, which for most steady riders associate #20 with Cherokee. My suggestion would be use #43 which was the Barracks street car route number. Good morning Don. The newly-created #20 South Broadway will cover trips that were previously served on the #48 South Lindbergh MetroBus route. As for the #20 South Broadway name, there was a lot of discussion (as is typical with all new MetroBus routes). In the end, that’s the number we picked and went with. Since marketing material and signage is moving forward, a revision to this route would be hard to change. The new routes, eight in total, will provide passengers with more direct service and better reliability. Thank you Mr. Hibbard for the reply. When the system route changes occur will #48 South Lindbergh terminate at South County or will the route change? Also in your reply, you said that there is a lot of discussion when renaming/numbering a route. Does anyone in the Metro staff ever ask long term employees/drivers on a suggestion? Do they ever check the library/archive of the bus route history of the company to see if a ‘historical’ name or number would be correct? An example your new upcoming route #31 Chouteau is very close to the old #54 Manchester-Rock Hill Loop Bus Route. (Manchester Bus actually had 5 route numbers associated with it 53-57). But Que Sera, Sera. Actually the reumbering of the old Cass half of Soulard line was historically correct. In the early part of the 1900’s, there was a #19 St. Louis street car line. Don, you’re very welcome. The #48 South Lindbergh will terminate at the South County Mall. As for the name, yes, name input does involve the MetorBus garage and operators. I hope the transfers will be co-ordinated timewise so it will be a smooth transition. I rode the #30 Soulard to work at 11th and Cole. I will now have to take the new #30 and then transfer to the #32 ML King to get me to where I need to go, it has the same route as #30 Soulard did going over 9th to Cole and coming back on 10th right next to my office. I won’t take the second half of new #19 because when old #30 went over 14th, drivers used to tell me not a safe place to wait by parking lots, not many people around. So I’d walk to Washington and take #99 trolley to 14th transit center and get on the #30. I liked it much better when #30 was switched to 9th north and 10th south. That was an easy route for me but now it will be changed and I will have to transfer again. Looks likes buses will be close together in bus bays but hope the time between #30 and #32 will allow me to get from one to other and not just miss it and have to wait around 30 mins or so for next one. Metrolink dont help, too far to walk from 6th to 11th and Cole. I would have preferred that the routes had been left the same, but that’s how it goes. I’ve rode many buses over the years working at different places downtown and old #30 was the best of the bunch. Mary, thank you so much for your feedback regarding the service change that will occur on August 14. For the most part, we’ve built in about 10 minutes between trips at the Civic Center Transit Center. This will allow passengers to take advantage of the indoor waiting area, use the restroom or purchase a snack. The buffer time will also allow you to make connections much more easily. A few routes, such as the #30 Soulard MetroBus route, will be expanded, providing passengers with more direct service and better reliability. As for future MetroBus service, the planning department is able to modify MetroBus service four times each year. You can provide us your feedback by contacting Customer Service. Customer feedback, along with ridership data and trends, are used to shape future service. Thanks for the info, Matthew. That was my concern that the new Arsenal bus would pull up and the new ML King would be pulling away.